Book and 2 CDs adapted by Cory Christiansen. Building on the success and popularity of "Vol. 1 - Jazz Guitar" and "Vol. 2 - Nothin' But Blues for Guitar", Corey Christiansen has adapted another classic, "Vol.3 The II/V7/I Progression" for guitar. As with the previously mentioned adaptations, this one uses both standard and TAB notation and is correlated closely to the original edition, but speaks directly to the aspiring jazz guitarist and addresses all of the important techniques and concepts used by jazz guitar legends to solo and comp over II/V7s. 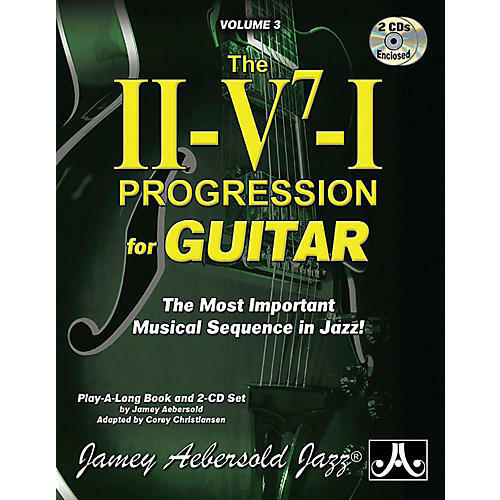 Completion of this easy-to-understand volume will have you ready to play any song that contains II/V7s, including most songs of the Bebop and the Great American Songbook era. Includes 2 CDs of trio accompaniment and demonstration tracks plus free bass-and-drum-only mixes available online that allow you to "sit in" and practice without the recorded guitarist present.